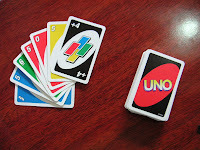 Uno! - students have to name the colour & number or instruction in the target language as they play. Useful & fun to add extra words such as "cheat!" "I win!" "whose turn?" and, of course, you can purchase games like monopoly in the Target Language. Even better: there is the option of getting your students to design board games - some of these are great and almost professional in standard! Twister is a good one too - just need to cover the English with Indonesian labels and call out body parts and colours in Indonesian. I thought this one would be great for a school camp! He wrote dozens of short stories, all of which had a clever and unexpected ending. Try this one: http://bit.ly/C89j6 Good luck!